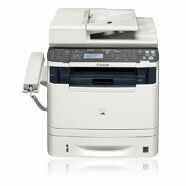 Canon’s LASER CLASS 650i Multifunction Facsimile System offers the flexible productivity for your business. The rich fax feature set includes versatile dialing capabilities, high memory capacity, and the ability to automate the storage of incoming data with Job Forwarding. Beyond fax, there are numerous functions that help achieve seamless workflows and enhanced productivity. The LASER CLASS 810 supports a rich fax feature-set, with high-speed Super G3 capabilities, fast scanning speeds, and even automatic scanning of two-sided originals.